Description: This shrub is 3-8' tall, erect, and abundantly branched. The bark of older branches is gray or gray-brown and slightly roughened from the abundant small lenticels. Young stems are pale green, yellowish green, or red; they are devoid of hairs. Opposite leaves up to 4" long and 1½" across occur at intervals along these stems; they are lanceolate to ovate and smooth along their margins. The upper leaf surfaces are medium green, yellowish green, or reddish green, while their lower surfaces are pale green; sparse appressed hairs are sometimes present on both the upper and lower leaf surfaces. Leaf venation is pinnate; there are typically 3-4 curved lateral veins on either side of the central vein on each leaf. The leaf bases are rounded to wedge-shaped (usually the latter), while their tips are long and slender. The slender petioles are up to ¾" long. Occasionally, dome-shaped panicles of flowers are produced; they are about 1½–2½" across and about as tall. Individual flowers are about ¼" across, consisting of a short calyx with 4 small teeth, 4 white lanceolate petals, 4 stamens with pale yellow anthers, and a central pistil. The branches of the panicle are hairless and cream-colored when the flowers are produced; later they become bright red when the fruit matures. The blooming period occurs from late spring to mid-summer and lasts about 3 weeks. The flowers are replaced by globoid drupes about ¼" across that become white at maturity. Each fleshy drupe contains 1-2 furrowed seeds. The root system can produce clonal offsets from underground runners; this can result in a thicket of small shrubs. 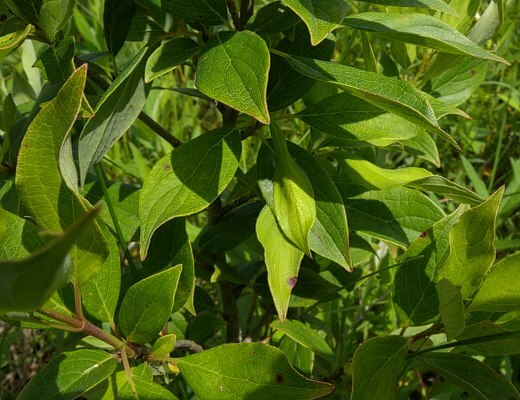 Cultivation: This shrub prefers partial to full sun and moist to mesic conditions; it tolerates a wide range of soil types, including soil that is loamy and rocky. Range & Habitat: The native Gray Dogwood has been found in most counties of Illinois; it is a common shrub. Habitats include open woodlands and woodland openings, savannas, prairies, limestone glades, thickets, fence rows, abandoned fields, powerline clearances, and roadsides. 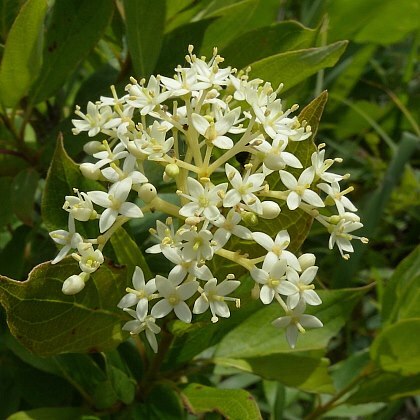 In wooded areas, this shrub tends to spread in response to wildfires and selective logging of trees. It is found in both high quality and degraded habitats (more often, the latter). Faunal Associations: The nectar and pollen of the flowers attract a wide variety of insects, including bumblebees, honeybees, little carpenter bees (Ceratina spp. ), cuckoo bees (Nomada spp. ), Halictid bees, masked bees (Hylaeus spp. ), Andrenid bees, miscellaneous wasps, Syrphid flies, dance flies (Empididae), Tachinid flies, flesh flies, blow flies, Muscid flies, butterflies, and miscellaneous beetles. The short-tongued bee Andrena fragilis is an oligolege (specialist pollinator) of dogwood flowers. Many insects utilize Gray Dogwood and other dogwood shrubs as a food source. These species include the larvae of long-horned beetles (Oberea spp. ), leaf beetles (primarily Calligrapha spp. ), flea beetles, several aphids (primarily Aphis spp. ), the plant bug Lygocoris communis, the thrips Scirtothrips niveus, the spittlebug Clastoptera proteus, caterpillars of the sawfly Macremphytus testaceus, caterpillars of the butterfly Celastrina argiolus (Spring/Summer Azure), and larvae of the midge Resseliella clavula. The larvae of this latter insect form club-shaped swellings on the stem-tips of Gray Dogwood. The caterpillars of many moths also feed on dogwood (see the Moth Table for a listing of these species). The berries of dogwood are an important food source to many birds (see the Bird Table). These berries are also eaten by many mammals, including the Black Bear, Raccoon, Striped Skunk, Fox Squirrel, Gray Squirrel, Eastern Chipmunk, and White-Footed Mouse. Both the Cottontail Rabbit and White-Tailed Deer browse on the branches and leaves. Because of its dense branching structure, Gray Dogwood is often used as a nesting site by several songbirds. When it forms dense thickets, this provides good cover for many birds and small mammals. Photographic Location: The Loda Cemetery Prairie in east-central Illinois. Comments: This small dogwood is sometimes cultivated as a multistemmed shrub. Generally, Gray Dogwood (Cornus racemosa) can be distinguished from other Dogwood shrubs by its dome-shaped panicles of flowers, which are about as tall as they are wide. Other species in this genus produce flat-topped panicles of flowers that are wider than they are tall. Except for Cornus obliqua, the leaves of Gray Dogwood are more slender than those of other Dogwood species. The mature berries of Gray Dogwood are white, rather than pale blue or dark blue-violet. Other species in this genus with white berries include Cornus drummondii (Rough-Leaved Dogwood) and Cornus sericea (Red-Osier Dogwood). Rough-Leaved Dogwood has leaves that are more hairy and broad than those of Gray Dogwood, and its stems are also hairy, rather than smooth. It is often, but not always, a larger shrub than Gray Dogwood. Red-Osier Dogwood also has wider leaves and its stems are bright red to a much greater extent.